The Furuno FA50 is a Class B AIS (Automatic Identification System) capable of exchanging navigation and ship data between own ship and other ships or coastal stations. It complies with IMO MSC. 140(76) Annex 3, A.694, ITU-R M.1371-2 and DSC ITU-R M.825-3. It also complies with IEC 60945 (EMC and environmental conditions). The FA50 consists of a transponder unit with GPS antenna. A VHF antenna is required and should be supplied separately. The transponder contains a VHF transmitter, two TDMA receivers on two parallel VHF channels, interface, communication processor, and internal GPS receiver. 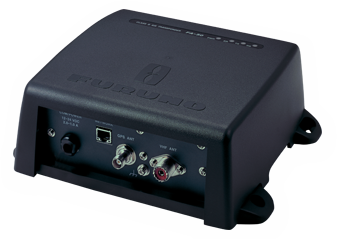 The internal GPS is a 12-channel all-in-view receiver with differential capability. It also gives position, COG and SOG. UAIS rated VHF Antenna is required option - use FAB-151D or purchase locally. If an aftermarket antenna is used, it must be capable of transmitting at 156.025 - 162.025 mHz.